Remember the post about my acquiring the above machine? I really enjoyed the comments from everyone on what machines they had and how many you all had. Among the commenters was The Quilt Rat. You should go right now and check out her blog and especially check out the pictures of her toy sewing machines, which there is a link to in her right side bar. Counting her 78 toy machines, she has a total of 93 machines! Makes my puny 8 machines look like nothing! By the way, I have used that old machine above to free motion quilt a table topper and it worked great doing that task. I still need some practice but I was very pleased with the results. I'll post a picture next week of that. In the meantime, have a Happy Mother's Day. I only have one toy sewing machine . I love your machine . 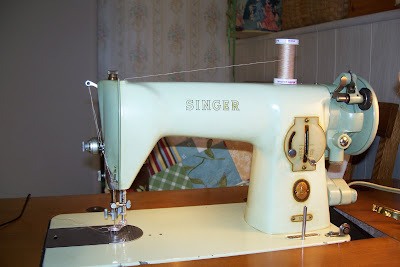 I really like that machine - Singer sure takes the prize for making the prettiest machines! You asked in an earlier post, what we collect. I have a collection of Amber Cabbage Rose depression glass that I have been collecting for years. Like you, I like to find it for "reasonable" prices so the hunt is a lot of fun.